We are saturated with choices and overwhelming demands these days. Life is very fast. We are all spinning the plates society requires of us just to survive. We sleepwalk our way through life, feeling fragile and stressed, juggling impossible expectations thrust upon us via the media, family, work, and relationships. The aim of this weekend is to guide you out of the depths of fragility and back on the road to Personal Empowerment. The focus of this retreat is on stopping, enjoying silence, beauty and rediscovering our inner compass. Take some time out of your busy schedule and make TIME FOR ME. “Make” the time – you’ll never “find”, and spend time with nature, in a beautiful location with good company and good humour to restore and replenish yourself for the year ahead! This one-day workshop will concentrate on how to identify and to heal out negative core beliefs about ourselves. Many illnesses and habits that rule our lives are as a result of out poor self-image which ultimately leads to self sabotage. An innovative and radical approach to confidence building and self-esteem will be presented based on the work of Cherri Huber who leads the Zen Meditation Centre in L.A. Most of us know on some level that in order to love another, we have got to be able to love ourselves first and although we can logically understand the concept of learning to love the self, few of us actually practice the art of loving on ourselves. Reiki is not a glorified beauty treatment, nor a relaxation method, it’s a way of seeing & experiencing the world. A way of understanding the Energy which flows within us, and around us, and between ourselves & others. You do not have to want to “give” people reiki treatments to benefit from learning about Reiki. Reiki is a helpful pathway through our lives. We can practice simply by being present to people in a deeper way, and understanding more about this flow of energy which moves through everything. We learn about how & why our energy flow can become blocked, locked or stagnant; how to recognise & protect ourselves from the negative energy from others which can drain us, and impact on our own wellbeing & health. The term Reiki can be off-putting for some; but it’s simply a Japanese term , as it was first taught there, in its original form by a Japanese Zen Buddhist named Dr.Usui who lived at the turn of the last century. However, he was simply re-discovering a way of looking at & being in the world which is timeless. Learn the comprehensive history of Reiki Healing, the 5 principles and the hand positions required to carry out a full body treatment. Self-Reiki, grounding and protecting yourself will also be an integral part of these 2 days. 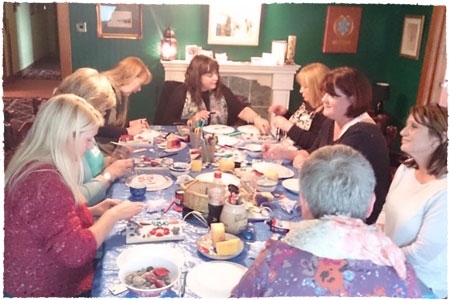 A non residential course at Angela’s house in the peaceful countryside, 20 minutes outside Glasgow. On Reiki Level 2 we amplify & develop our capacity to transmit loving intent to Practitioner Level, to work as Reiki Therapists; we learn to send Distance Reiki to people & places across time & space, and how to practice Energy Space Clearing of homes/workplaces. We further develop our intuitive abilities as we learn how to live more from Heart than the Head. The Reiki 2 course is for First Degree graduates who wish to pursue a higher level or Reiki. You are given the gift of three sacred symbols which empower you, enhancing your relationship with yourself, other, partners and everyone you come into contact with. In addition, you will develop the ability to send distance healing and focus the energy to clear space. A non-residential at Angela’s home in the peaceful countryside, 20 minutes outside Glasgow. N.B. Students who have undertaken training with other Reiki masters for Reiki 1 are welcomed on this course. This weekend is for Reiki 2 degree graduates who wish to deepen their experience of Reiki and to increase their energy levels. The third degree trains the student to become a Reiki Master who can offer attunements to clients who would benefit from self reiki, and to become a teacher. N.B. Students who trained elsewhere for Reiki 1 & 2 are welcome to attend. Another fantastic course presented by Angela’s unique, easy to follow style. Just what the doctor ordered. WHY SHOULD YOU LEARN REIKI ? – You can also give Reiki to children animals, plants, in fact all living things. – Therapists report a shift in the way that they work, their clarity, & level of success in their work from this new perspective.